TITANIA INGLIS / NEWS: It's official! 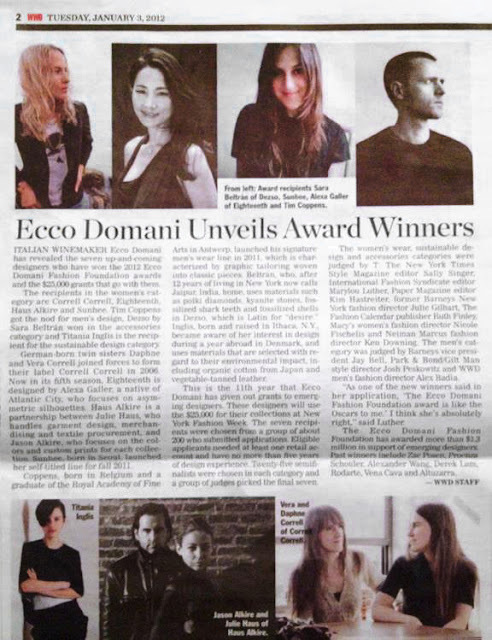 My line has won the 2012 Ecco Domani Fashion Foundation award for Sustainable Design. I'm deeply honored to have been given this opportunity, and looking forward to showing my new collection at New York Fashion Week in (gulp...) a month. I'm lucky to have an amazing team lined up to help me put on this show; will reveal more details as we get closer to next month, but for now, back to patternmaking and more patternmaking! You are awesome and winning the award is something that will boost your energy to make and even more great collection.